Since the start of this year, two curious new groups have set up shop in Brussels: the Consumer Choice Center and an EU branch of the Freedom Organisation for the Right to Enjoy Smoking Tobacco (Forest EU). They claim to represent consumers, but a closer look shows no links to those they allege to speak for. At the same time, they seem to be exclusively funded by corporations like Japan Tobacco International and right-wing billionaires such as controversial US plutocrats the Koch Brothers. Both groups add their voices to a network of corporate-funded organisations aggressively pushing for de-regulation in the EU. This does make it look like the Consumer Choice Center and Forest EU represent their funders’ rather than consumer interests. Here we take a look at the groups in more detail to see if they are indeed lobby outfits pushing a corporate agenda. ‘Consumer choice’ organisation speaking up for industry? In March 2017, a new consumer rights organisation announced, with much fanfare, that it was setting up shop in Brussels. 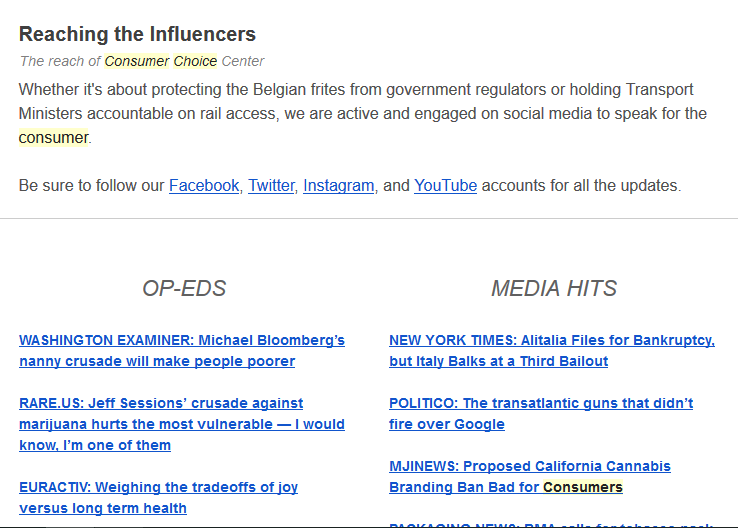 The Consumer Choice Center (CCC) was first featured in Politico’s publication for EU insiders, Brussels Influence, which presented them as “a grassroots-led movement” aiming to “mobilize millennials against what its founders argue is the overburdensome regulation that limits choice”. An intriguing message, especially coming from a completely unknown organisation. So, what is the CCC? The group’s website states that it “represents consumers in over 100 countries across the globe” and that it monitors regulatory trends in Washington, Brussels, Geneva and other “hotspots of regulation”. Its professed mission is to “inform and activate consumers to fight for #ConsumerChoice”. But details about what this entails are sparse. Still, the CCC’s entry in the EU’s lobby register does provide some further information. As it registered as a not-for-profit organisation, the CCC has had to declare its total budget: with €3,652,198 it is not in a terrible position for an entirely new entity, although CCC’s director Frederik Roeder described the outfit as “pretty much bootstrapped”. Of its budget, the CCC expects to spend between €100,000 and €199,999 on lobbying the EU institutions - a surprisingly low number given that it has declared four full time lobbyists. Beyond the top-line figures, the CCC lobby register entry keeps quiet about where the funds have come from. It only states that they originated from “donations” without specifying the source(s). Publicly, the CCC had previously stated that it would not accept public funding but was “totally open” to corporate donations. Things became clearer at the CCC launch event in April 2017. Held in the lobby of a hotel just two minutes from the European Parliament, the launch was billed as an introduction to the group, with two CCC speakers plus interventions from a representative of UK libertarian think tank Institute of Economic Affairs and EPP MEP Stefano Maullu. The launch was a peculiar affair for a grassroots event, attended almost exclusively by men in suits and sporting a vase for business cards at the door. During an unscheduled question and answer session, a guest who introduced themselves as a lobby consultant inquired about the source of CCC’s ‘three million euros’ budget. Finally, we got an answer from Roeder, who confirmed the group’s seed funding came from the US based Students for Liberty (SFL), although CCC is currently soliciting additional funds from corporations. The Consumer Choice Center’s connection with SFL is not exactly hidden, as they feature on the CCC’s website as well as in its lobby register entry, although it is variously referred to as a parent organisation and member, rather than a funder. The SFL itself is a network of libertarian student groups that “began as a 12 person roundtable during the Institute for Humane Studies’ 2007 Koch Summer Fellowship”. Even though the SFL does not disclose a complete list of its own funding sources, it seems that most of its income originates from US right-wing plutocrat Charles Koch, of the Koch Industries, as well as from a network of think tanks and foundations, including the Atlas Network and the Cato Institute, which are themselves in turn at least partially funded by the Koch Brothers (see SFL’s annual report for 2008-2009 and annual report for 2015-2016). In recent years, the SFL has expanded beyond the US and its operations seem to follow what the author of Dark Money, Jane Mayer, describes as Charles Koch’s goal of “recruiting future generations to his ‘movement’. Greenpeace US goes yet further, when it describes the network as “an arm of Charles Koch’s numerous recruiting, training and networking operations [aiming] to develop professionals who operate under his ‘culture’ of Market Based Management and ideology of unrestrained corporate power”. It can be quite hard to identify where SFL ends and CCC begins. They are registered at the same address in the US (compare CCC and SFL), and, perhaps more importantly, almost all of CCC’s staff are either alumni of the student network or currently also hold posts there. Of those that seem active in the EU, CCC’s deputy director Yael Ossowski is also the Senior Development Officer for SFL; CCC’s European Affairs Manager and only holder of a lobbyist badge for the European Parliament Luca Bertolloti is also a development associate at SFL; and CCC’s Managing Director Fred Roeder is also SFL’s Chief Strategy Officer. In the end, SFL seems to be the main funder of CCC at present, and is almost wholly responsible for staffing it, but still manages to evade the requirement to register as a lobbying organisation itself and disclose its own funding sources, which do have a very clear lobbying agenda. Indeed, the only CCC staff member who doesn’t seem to be involved with SFL is Adam Cleave, a “senior advisor who gives advice from time-to-time”. However, Cleave is also the Director of newly formed lobby group, APC Political and Corporate Affairs Consultancy (which does not yet have a website and is not yet registered). Up until February 2017, Cleave was also senior lobbyist for the Imperial Tobacco Group. Perhaps unsurprisingly, SFL is not the only donor the CCC has acquired so far. CCC’s launch event was sponsored by both SFL and Japan Tobacco Industry, a fact confirmed by Ossowski in an email exchange with CEO, in which he stated that he was “delighted to receive financial support from both Students For Liberty and Japan Tobacco International for our launch event in Brussels”. Ossowski also added that the CCC has so far had “a good number of other contributors from different industries” in the energy, healthcare and FMCG (fast-moving consumer goods) sectors, although he refused to name any of them. Funnily, during CCC’s launch event Roeder listed the policy areas they planned to get involved in, which included digital issues, but also product branding, taxation and sales regulation as well as healthcare and medical innovation. When asked about the risk that such corporate funding poses to CCC’s independence claim, Ossowski referred back to CCC’s Code Of Ethics, a document which appears to be little more than a list of vague intentions, reaffirming their independence and refusal to take public money. In spite of its biased funding base, CCC still fashions itself as a “grassroots organisation”, a rather puzzling assertion, since there is no information about how an individual or even an organisation can join up or get involved. The CCC claim to represent consumers in 100 countries and its entry in the Transparency Register, declares that it has 250 individual members (in addition to SFL). When asked directly who these members are, Ossowski replied that “[O]ur members are our supporters and activists based around the world. We are not a membership-based organisation, but rather count among our numbers individuals who join in order to push for more consumer choice.” He then went on to point to articles recently published by such activists, including one written by the North American Director of Students for Liberty (SFL), and another written by himself, in his capacity as Senior Development Officer of SFL. Both articles dealt with US politics. CCC’s activities also seem to contradict its own claims regarding what it does. Its mission to “empower consumers” appears to be limited to curating stories, creating narratives and giving tools to consumers, as Roeder described in his own words at the launch event. Which tools and which consumers? We’re not sure. In practice, CCC’s activities apparently boil down to insisting that consumer choice always equates to less regulation, whenever any regulatory or lobbying-related discussion at EU level provides a hook. It is quite telling that some news media have already picked up on some of CCC’s press releases and social media statements, quoting them with the authority of a fully-fledged consumer rights organisation. Apparently, they did not notice that it is entirely funded by corporations, nor that it does not even seem to have any real link to consumers themselves. A New York Times piece, for example, describes the CCC as an “Italian consumer rights organization” and a Politico Europe article about Google references them as an “advocacy group” without providing any further qualification. The CCC has also been lobbying EU institutions as if it were a representative consumer organisation. At the same time, the CCC appears to enjoy attacking public health campaigners and genuine consumer organisations, which have been fighting for better consumer protection and stricter regulation of corporations. They have clearly targeted The European Consumer Organisation (BEUC), for instance, as can be seen in this Politico interview, and more recently Greenpeace. Read CCC's full email here. Another group that has recently started up operations in Brussels is active in the same network as the CCC: the pro-smoking lobby group Freedom Organisation for the Right to Enjoy Smoking Tobacco in the European Union (Forest EU). The pro-smokers group is an ‘extension’ of Forest UK, which has been fighting tobacco regulation since 1979 as a political and media lobby group. The Brussels arm is now aiming “to represent the millions of consumers throughout Europe who enjoy smoking tobacco and don’t want to quit”. But the comparison to Forest UK may only have deepened suspicion towards Forest EU, as its UK mother organisation has been embroiled in controversies from the get go. For many years, Forest UK refused to disclose its funding sources, and only conceded that it is funded mostly by tobacco producers when asked a direct question during a parliamentary hearing. At that time, Clark confessed that without such support “it would be very difficult for Forest to exist”. According to TobbacoTactics this intimate relationship seems to have existed since Forest’s inception. A confidential industry document shows that Sir Christopher Foxley-Norris set up Forest UK after he had written to British American Tobacco in 1978 asking to be involved in running a consumer association for smokers. At a meeting, British American Tobacco staff told him that the company had been considering to form a consumers’ body for some time and that his proposal was very much in line with this idea. It is also worth noting, that Périgois, director of Forest EU, also seems to be the Director of Everjust.eu, an unregistered lobby consultancy whose websites describes its clients list as “corporations, trade associations and non-profit organisations that value impact and confidentiality.” Périgois’ LinkedIn profile is more informative: “his portfolio includes a banking association, a big five tobacco firm and a transatlantic foundation.”* Everjust and Forest EU share the same address. Guillaume Périgois has claimed that the organisation “represents the consumer, not the tobacco industry”, and that he would happily criticise tobacco companies if they acted against the interests of smokers. Whilst such an assurance is welcome, it is hard to see how a group can maintain such an independent stance when their funding comes from one tobacco company entirely, and could therefore be withdrawn at will, bringing organisational operations to a standstill. We find an army of public health and anti-tobacco lobbyists encamped in Brussels and it’s clear they enjoy the close ear of certain decision-makers. It’s high time we helped to bring a bit of balance to the paternalism versus freedom discussion here in the EU capital. Read Forest EU's full email to CEO here. Both CCC and Forest EU seem to be working in the same libertarian network pushing for corporate deregulation in Brussels. At their launch event, the CCC congratulated itself for cooperating with Forest EU and libertarian think tank EPICENTER and their members, which include the UK-based Institute of Economic Affairs. There, Forest EU’s Périgois said he was glad to support the CCC, since he saw tobacco regulation as the blueprint for other sectors. There also seems to be a considerable overlap between these groups and the organisations which have been attending their events. It is worth taking a second to look at EPICENTER, a think tank created in October 2014 by six libertarian think tanks from across the EU, including the Institute of Economic Affairs. Even though EPICENTER has now been working in Brussels for close to three years, we still know very little about it. Its lobby register entry still doesn’t reveal how much it spends on lobbying as it claims to be a newly formed entity with no closed financial year, even though it seems to have been working for almost three years. There is likewise no information about who funds EPICENTER, as it is registered as a think tank the current lobby register does not oblige it to disclose this information. EPICENTER works on a wide variety of topics, publishing its own reports and promoting reports from its members. Since 2016, it has been promoting the Nanny State Index in Brussels, a report created by the Institute of Economic Affairs, which ranks EU countries according to their level of regulation of consumer products such as soft drinks, alcohol and tobacco. The starting point for this index is clearly the idea that any regulation is a bad regulation. This was the report was presented during the CCC’s launch event by Chris Snowdon, Head of Lifestyle Economics at the Institute of Economic Affairs. This is not so surprising, given that Students For Liberty are counted as collaborators. Snowdon is also the author of “Euro Puppets”, a report attacking NGOs funded by the EU Commission, tapping into a particularly hot debate in Brussels these days. This EU-level publication appears to be related to “Sock Puppets: How the government lobbies itself and why”, a report challenging NGOs receiving funding from the UK Government. In the UK, the Institute of Economic Affairs has even been accused of spearheading the lobbying gag law, which forbid charities from using public funds to influence public bodies. The IEA has been at the centre of a controversy following, being accused of making donations to the ministers responsible for it and refusing to reveal the single donor behind that project. Like Students for Liberty, the Institute of Economic Affairs is not registered in the EU lobby register, even though its registration with the British Charity Commission claims that it works in Belgium and publications like its Nanny State Index certainly focus on the EU. This year, the Institute of Economic Affairs was also named one of the least transparent think tanks in the UK according to Transparify, which included it in the “Highly Opaque and Deceptive Players” category. It is completely opaque who funds Institute of Economic Affairs at the moment, but we do know that in 2013 the Guardian reported that it received tens of thousands of pounds from the tobacco industry, including JTI. JTI’s senior EU lobbyist Ben Townsend was also a speaker at EPICENTER’s Nanny State Index Conference in 2017, and JTI continues to use research from the Institute of Economic Affairs and EPICENTER to further its own lobbying efforts. There is thus a very strong suspicion that the tobacco industry is making concerted efforts to support organisations such as EPICENTER and the Institute of Economic Affairs. At the very least, they share very close links. Be it in connection with the Consumer Choice Center, Forest EU, EPICENTER or the Institute of Economic Affairs, Japan Tobacco International (JTI) keeps popping up. According to its declared lobby spending, the tobacco producer has been increasing its lobbying operations in Brussels substantially, having almost tripled its 2015 spending to €1,500,000 - €1,749,000 in 2016. Its entry in the transparency register explains this spike via the fact that JTI had not previously included in its lobby spending the “annual membership fees paid from JTI to its member organisations”. This implies that JTI spends almost one million euros in membership fees a year alone to other organisations that represent its interests, presumably including tobacco producers’ groups such as the Confederation of European Community Cigarette Manufacturers (CECCM) , the European Smoking Tobacco Association (ESTA), business chambers and trade associations like BusinessEurope, and think tank the Center for European Policy Studies. And this does not yet include the funding given to CCC or Forest EU. JTI is no stranger to the ‘Brussels bubble’, nor to member-state policy spheres such as the UK’s Westminster, where it is actively fighting against tobacco regulation. In Brussels, it has also sponsored a special section of policy outlet Euractiv called “Regulating Consumers”, in which Forest EU were quoted on the issue of plain packaging and the CCC was able to pen an opinion piece criticising tobacco and alcohol regulation and public health campaigners. Interestingly, in 2017 JTI has itself become more active in debates around lobby transparency. In November 2016, for instance, it sponsored a Euractiv debate entitled “Who is lobbying for the lobbyists”. JTI’s basic claim at this debate was that it supports transparency around lobbying – but that no distinction should be made between those lobby actors who adhere to transparency rules, independently of whose interest they represent. This stance echoes the consultation replies of membership organisations which the tobacco company belongs to, including those of CECCM and ESTA. This preoccupation with transparency for transparency’s sake seems to result from the requirement for EU policymakers to implement the World Health Organization’s Framework Convention on Tobacco Control Article 5.3, which mandates them to keep contacts with tobacco lobbyists to a minimum. Article 5.3 is a response to decades of intensive lobbying by the tobacco industry, including activities by so-called front groups, such as retailers’ associations and smokers’ groups - which are directly or indirectly tied to the tobacco industry. Read JTI's full email here. Of course, the tobacco industry is not the only one to use such tactics. Just a few years ago, the European Privacy Association revealed that it was backed by tech giants Facebook, Google and Microsoft, following an official complaint. Several years before that, it was climate-change think tank International Council for Capital Formation (ICCF) which hit the headlines over its Exxon funding. For Big Business, such front organisations are extremely useful, as they allow corporations to protect their reputation, even though they are pushing controversial arguments and attacking other organisations. The veneer of legitimacy, neutrality and credibility many front groups claim for themselves via the status of think tanks or NGOs adds to the convenience of this lobby channel. It is quite worrying that such organisations are still being set up in Brussels, posing as independent agents, which represent consumers or activists, while driving an aggressive corporate-friendly de-regulation agenda. The cases of the CCC, Forest EU and EPICENTER all show the need to enable proper scrutiny through stricter lobby transparency regulation, and to close the loopholes that still allow corporate influence to go unchecked. Seeing that these groups originate in the US and the UK but have expanded their operations to Brussels following the election of Trump and the victory of Brexit, the EU may be the next prime target for those pushing a deregulation agenda that puts corporate profits before consumer rights and protection. All that huffing and puffing over two toddlers in the lobby circus. Where is the outrage about all those organisations that keep insisting on banning this and that. Or is it ok, because "banning" is a favorite left wing sport? No need to notice how massively many of those "health" organisations are dependent on the altruistic funding by the pharmafia. Spare me the drama, queen. I'm a consumer and also an avid supporter of Forest - I declare that I have no interest in any tobacco companies but have been a smoker of Benson & Hedges for nigh on 55 years. As a Cambridge University educated adult, I, along with tens of millions of others, thoroughly resent the constant march of regulation from meddling governments - especially when they are based upon tissues of lies, such as the effect of second hand smoke or the costs to the health system, when viewed as a one sided equation. In a liberal society, adults should be free to make their own decisions. We perfectly well know the risks associated with smoking and are quite able to make decisions accordingly. Similarly, businesses such as bars should be free to decide whether to allow smoking or not, and to hire staff accordingly. That's amazing how biased this article is. The CCC, that I support, is basically working to let people live freely without governement intervention in their life. We know how bad are the effect of this "well intentioned" legislation to say to us what we can eat, drink and smoke. It's a belief shared by numbered of politicians that think they can govern our life and think they are smarter than us. But you know what ? This legislation benefit big corporations that make much more sneaky lobbyism by showing their "good intention" when it is known that the rules put in place to protect consumers are aimed above all at protecting them from competition and increasing prices at the expense of purchasing power of citizens.